We see in this week's reading the beauty of forgiveness and reconciliation in the story of Joseph and his brothers. Their story is a beautiful picture of Jesus forgiving sinners who come to repentance and are reconciled to God. Here are my S.O.A.P.s for Genesis 44 and 45. I would love to hear your thoughts about these chapters. Feel free to leave a comment at the end of this post. Scripture: Genesis 44:1-2, 10-14, 33-34 And he commanded the steward of his house, saying, “Fill the men’s sacks with food, as much as they can carry, and put each man’s money in the mouth of his sack. 2 Also put my cup, the silver cup, in the mouth of the sack of the youngest, and his grain money.” So he did according to the word that Joseph had spoken. 10 And he said, “Now also let it be according to your words; he with whom it is found shall be my slave, and you shall be blameless.” 11 Then each man speedily let down his sack to the ground, and each opened his sack. 12 So he searched. He began with the oldest and left off with the youngest; and the cup was found in Benjamin’s sack. 13 Then they tore their clothes, and each man loaded his donkey and returned to the city. 14 So Judah and his brothers came to Joseph’s house, and he was still there; and they fell before him on the ground. Observations: Joseph continues to be guided by the hand of God in these tests of his brothers’ hearts with the intention of bringing about complete repentance in their hearts. When Joseph’s servant finds the cup in Benjamin’s sack, the reaction of the brothers shows their grief and disturbance over the loss of Benjamin that would be the death of their father. They tore their clothes and returned to the city. This time they don’t leave their brother in the hands of captives as they did Joseph; instead, they accompany Benjamin determined to stand with him in slavery or even death. Judah even intercedes for Benjamin offering to take his place as a slave to Joseph. This shows Judah’s concern for Benjamin as well as his concern for the well being of their father. We can see in Judah a change of heart as he offers his own life for the lives of Benjamin and their father. Application: There is no greater evidence of a changed heart than the sacrificial love for another. We are never more like Jesus than when we put the needs of others before our own. The same sacrificial love that Jesus poured out on us should flow from our hearts into our marriages, into our children’s lives, and into our friendships. Prayer: Heavenly Father, create in me a heart that longs to put the needs of others above my own. Help me to remember the sacrificial love Jesus poured out for me as I interact with those you have blessed my life with. Even more, I pray that You would help me to show sacrificial love to those who are not so easy to love and to those who have hurt me. Thank You, Jesus, for Your example of sacrificial love shown in that while we were yet sinners You chose to die for us. It’s in Your loving name I pray. Amen! Scripture: Genesis 45:1, 4-5, 7-8, 14-15 Then Joseph could not restrain himself before all those who stood by him, and he cried out, “Make everyone go out from me!” So no one stood with him while Joseph made himself known to his brothers. 4 And Joseph said to his brothers, “Please come near to me.” So they came near. Then he said: “I am Joseph your brother, whom you sold into Egypt. 5 But now, do not therefore be grieved or angry with yourselves because you sold me here; for God sent me before you to preserve life. 7 And God sent me before you to preserve a posterity for you in the earth, and to save your lives by a great deliverance. 8 So now it was not you who sent me here, but God; and He has made me a father to Pharaoh, and lord of all his house, and a ruler throughout all the land of Egypt. Observations: My heart smiled at today’s reading. What a beautiful picture of reconciliation! What a beautiful testimony of the power of God at work in Joseph’s life working ALL things together for good – not only Joseph’s good, but for the good of his family and the people of the land who were affected by the famine. Joseph’s cautiousness finally melts away as he feels assurance of the godly repentance that has led to a change of heart in the lives of his brothers. He is no longer able to restrain himself and all the emotion that he has been guarding within his heart he is finally able to release. Can you image the relief and the overwhelming sense of joy?! Cautiousness is pushed away to usher in a glorious time of reconciliation. Joseph recognizes God’s hand in the events that have shaped his life – both good and bad. He releases his brothers from the pain of guilt over how they sold him to the Ishmaelites by assuring them that it was God who sent him there to Egypt in order that lives would be saved during the famine. Tears are flowing and brotherly love abounds. Talks begin among brothers who have spent years apart from each other; I can just imagine them sharing with one another. 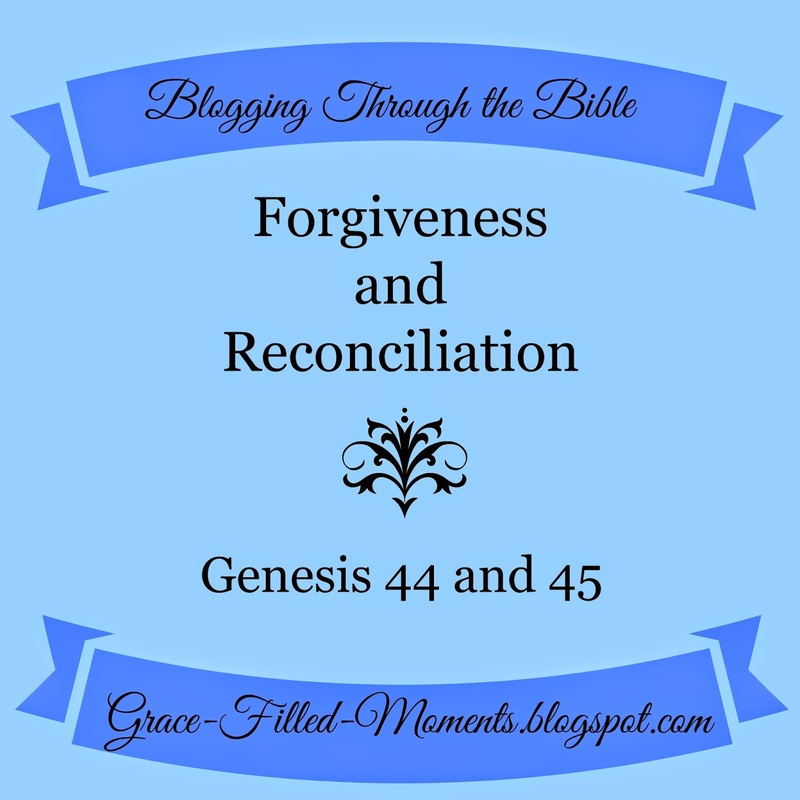 Forgiveness and godly sorrow that leads to repentance brought about this beautiful reconciliation. Application: God sees the big picture of all of the events – good and bad – that will make up the story of our life. Joseph’s life is a wonderful reminder that when God writes our story the ending will justify every.single.event. There are times of growth for us in the good times and even more so in the bad times of our lives. It’s in the bad times that I’m able to cling to what I know about God – knowledge I’ve gained by spending time daily with Him in His Word and through prayer. It’s in those bad times that I get to experience God…not just with a head knowledge, but with a heart knowledge as I find Him faithful to be Who He says He is and of His love for me. Prayer: Heavenly Father, thank You for the gift of salvation You have given to me through Jesus Christ. Because You first loved us, You provided the means of our reconciliation through the perfect and sinless life of Jesus. He fulfilled every requirement of the Law that we could not. It’s through His blood that we have been reconciled to You. Help me to live my life in the same way…to be the one to approach a broken relationship with love and forgiveness and a hand that is extended in an effort of reconciliation. In the reconciling name of Jesus I pray. Amen! 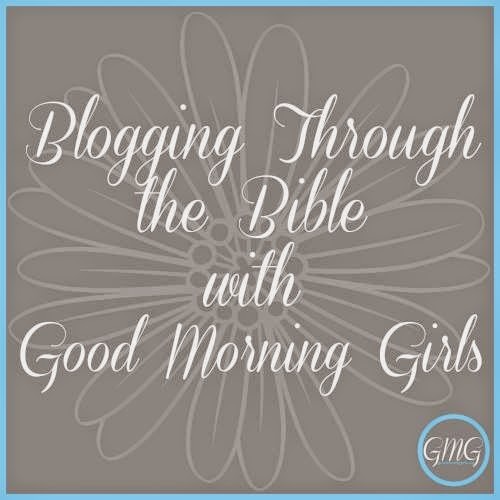 I'm linking up with this Blogging Through the Bible post with Courtney Joseph over at Women Living Well, home of Good Morning Girls. Read more Blogging Through the Bible posts by clicking on the image below.